The Dual Footswitch can woks with so many famous brand drum machine perfectly and comes with much lower budget. It can also use for amplifier to switch the effects or anywhere a dual momentary footswitch is needed. It makes your job quick easy,you just need to tap with foot, totally hands-free. You will impressive by it's heavy duty & small size. For use with the drum machine or anywhere a dual momentary footswitch is needed, it can also act as a amp footswitches for channel select. 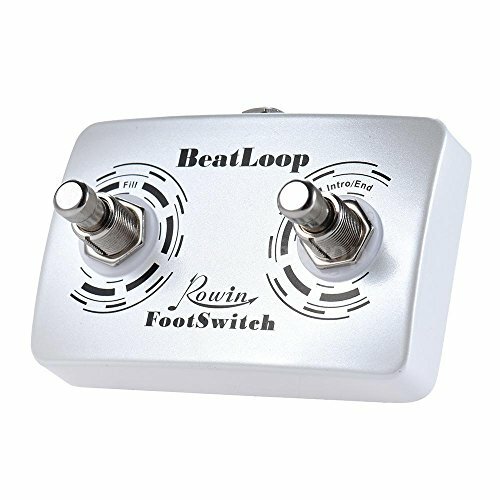 (For drum machine)The left foot switch for filling/ rythms/ into the recording pedal and makes the rythms more diverse.The right foot switch for adding Intro/ End rythms to the pedal. Solid&heavy duty constructions that made with zinc alloy. Super Mini size, light weight, very convenient to use and take. Includes: 1/4″ (6.35 mm) stereo cable.